My deepest fear had been realized. One of my clients questioned my actions and called me a bad doctor. Their pet did not get better after I saw her, and they blamed me. The sadness I felt for that patient was now intensified by the client’s attack on my veterinary skills and their threat to find another vet. Somehow that one conversation with an upset client had shaken the foundation of my confidence as a doctor. As I reviewed the case, I realized that I did everything in my power to help that pet. Rationally, I understood that the owner’s grief was causing them to lash out at me, but emotionally I couldn’t shake the thought of that case or the owner’s claim. I knew I was still a good doctor… wasn’t I? Then the next day I got a group message from a friend. She is a brilliant veterinary technician with amazing insights into the profession. She was reaching out to her support system because someone had questioned her integrity. The strange thing to me was that this very intelligent professional knew that the claims against her were false, but she still couldn’t shake the turmoil they caused. That was exactly how I felt. In the week since my incident with that client, three other colleagues had mentioned similar situations. They did their best. They knew what they did was right. However, an upset client attacked their integrity and made them question their professional confidence. What was going on? Why were so many amazing veterinary professionals experiencing this? It felt like there was a plague of veterinary dark magic…and I realized that all of us had faced Veterinary Boggarts. What is a veterinary boggart? Let me try to explain. During a Defense Against the Dark Arts class in Harry’s third year, Professor Lupin taught his students about boggarts. These shape-shifters will turn into the darkest fear of the person who sees it. I think my colleagues and I were experiencing veterinary boggarts: unexpected comments from clients that provoke our deepest fears in vet med. 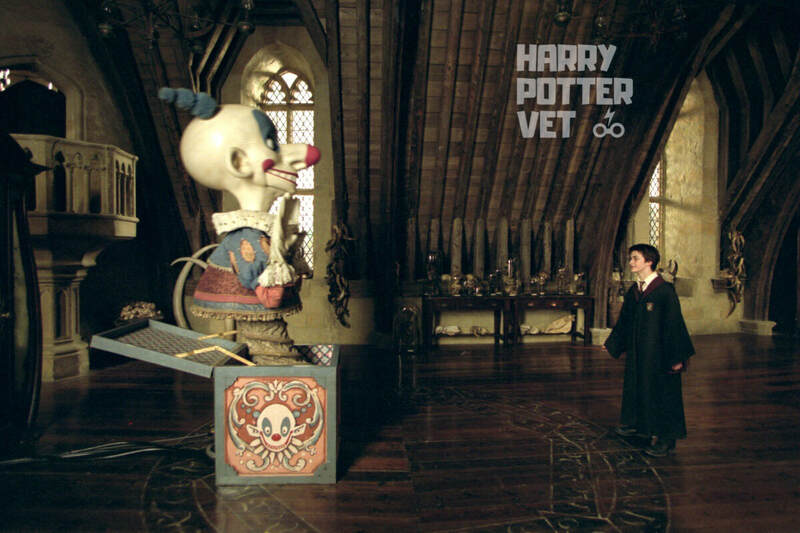 In the wizarding world, boggarts can take many forms, but the commonality of these veterinary bogarts is that they shake a professional’s confidence, which can cause irrational fear. The best analogy of this is when Molly Weasley encounters a boggart. Molly is a skilled witch – just look at how she defeated one of the most dangerously evil witches in history in a one-on-one duel during the Battle of Hogwarts! When Molly heads upstairs at 12 Grimmauld Place, she knows she is tackling a boggart – knows that whatever the boggart turns into isn’t real – but she still is overwhelmed when the Boggart turns into corpses representing her children. Rationally, she knows this is just a boggart, but emotionally it took its toll on her. She needed help from someone else to bring her back to reality and defeat her boggart. That’s how veterinary boggarts work. We know the attack is not based in reality. We know we shouldn’t let it affect us. Our mind can rationalize what is happening, but fear takes over. Suddenly our confidence is compromised, and we let our veterinary boggart overwhelm us. So, now that we’ve identified that we’re battling a veterinary boggart, how do we defeat it? In the wizarding world, the spell to defeat a boggart is “Riddikulus” and involves turning the boggart into something funny because laughter will conquer the boggart. At first, I didn’t think this spell would work for veterinary boggarts, but I’ve changed my mind. I went back to that group text from my colleague because some of the most brilliant veterinary minds I know were included in that discussion. The support started as expected – offering reassurance and comfort. But then the conversation morphed. Humor was added to brighten her spirits. The comedic factor happened naturally, but it was clear that her veterinary boggart was vanquished as the laughter took over. In the moment, addressing a veterinary boggart with humor may seem ridiculous, but because the boggart is irrational to begin with, maybe “Riddikulus” is exactly the spell we need. So, be on the lookout! Veterinary boggarts are most damaging when they are unexpected. I hope you can learn from my experience to help you recognize and battle any veterinary boggarts that you encounter in your career. Identify them for the what they are (ridiculous!) and find the humor in the situation to discover the veterinary magic needed to banish your veterinary boggarts.